Smith & Loveless has been manufacturing package pump stations and treatment plants since 1946 when it was founded by B.Alden Smith and Comprere Loveless. S&L package wastewater treatment plants have been effectively installed in all parts of the world, from above the Arctic Circle to the Tropics. S&L continues to offer reliable, cost efficient treatment for hotels, hospitals, schools, housing subdivisions, shopping centers, temporary or permanent worker camps, industrial developments, offshore drilling rigs, resorts, and various industrial waste applications. In the early 1970s, Smith & Loveless, Inc. received a contract from the St. Louis Ship Co. to develop a treatment plant to put on its barges that navigated the Mississippi River. The company was not allowed to dump its wastewater directly into the river. The company also desired to minimize water usage by reclaiming the treated “gray” water for the ship’s flush toilets. By 1979, the patented process called Fixed Activated Sludge Treatment (FAST®) was available for marine applications. From there, the FAST® technology has developed into a full product line providing treatment for various applications, which includes the Modular FAST® system. 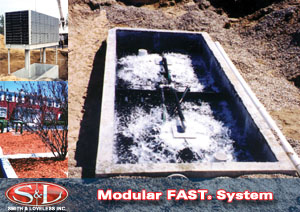 Modular FAST® is used throughout the country in various applications. Here in New England, J&R is pleased to offer the Modular FAST® treatment system for onsite applications up to 10,000 gpd. There are over 50 Modular FAST® plants installed in New England, ranging from restaurants to condominium complexes to schools. For more information on the S&L Modular FAST® treatment system please visit them online.